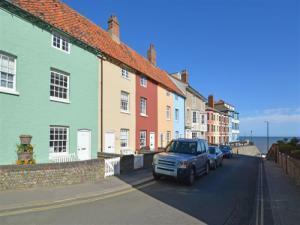 Saffron Cottage01263 715779work01603 870304fax Self-catering3 The Gangway is an 18th Century former fishermans cottage, fully refurnished to offer this stunning seaside accommodation. Set in the lovely seaside town of Cromer is is just a short walk from the sea, as well as all the amenities that the town has to offer. The cottage has been modernized whilst still retaining its original features and charm. • Utilities: Electric oven & hob, fridge with icebox, microwave, dishwasher, washing machine. • Access: Roadside parking or public carpark. 3 The Gangway is an 18th Century former fishermans cottage, fully refurnished to offer this stunning seaside accommodation. Set in the lovely seaside town of Cromer is is just a short walk from the sea, as well as all the amenities that the town has to offer. The cottage has been modernized whilst still retaining its original features and charm.